The folks at Skullgirls developer Lab Zero Games have left the fighting arena and headed into the open pastures of RPGland. Their new game, Indivisible, is a side-scrolling action-RPG with nods to venerable classics like Valkyrie Profile and Super Metroid, and they’re currently looking for a not insignificant $1.5 million on Indiegogo. 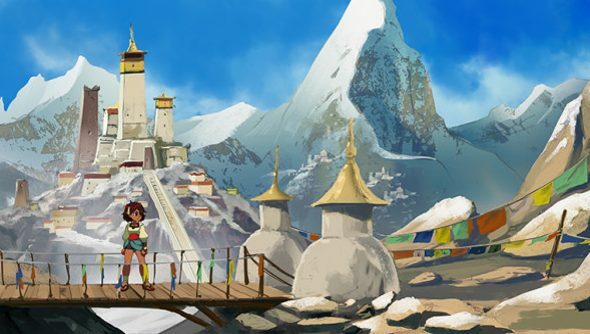 Indivisible pits Ajna, a tomboy martial artist, against a world of monsters after her village is, you guessed it, destroyed. Aside from her martial arts training, she’s also blessed with a peculiar power that allows her to absorb certain people, Incarnations, summoning them into battle or using them get new weapons and items. Metroidvania-style exploration is how Ajna gets around the world, with 2D platforming elevated by obstacles that require a particular skill or weapon to overcome. Upgrading her martial arts ability, the pitch explains, will also let her jump off walls, while getting an axe will allow her to chop through obstacles. Combat is a lot like Valkyrie Profile’s, but Lab Zero reckons it can add more depth and customisation thanks to their experience with fighting games. One departure from Valkyrie Profiles combat style is that Indivisible won’t be completely turn-based, instead employing cooldowns and allowing characters to attack whenever an ability becomes available. Indivisible already has a publisher, 505 Games. The game budget is $3.5 million, of which 505 Games will be putting up $2 million, with the rest being crowdfunded. If the pitch has tickled your fancy, you don’t need to pledge blind. You can grab a prototype of the game that’s been in development since May from the Indiegogo page.